Last time I checked in with Flannel Friday, I posted a Japanese nursery rhyme. I was inspired to look through the rest of our international collection and see what else I could adapt for use in storytime. 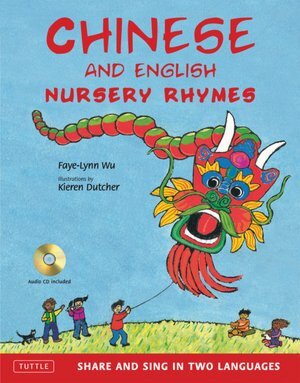 I was excited to discover that the same publisher behind Japanese Nursery Rhyme: Carp Streamers, Falling Rain also has a Chinese and English Nursery Rhymes book. For me, the Japanese title is more successful overall, but I did find a cute little rhyme called "Little Mouse" (not to be confused with this Little Mouse) which the book pairs with Hickory Dickory Dock. To find some oil to nibble. Ji-li-gu-lu down fell the mouse. And I couldn't resist sharing this video of a little girl reciting "Xiao lao shu," as it's called in Chinese. Once again I used Open Clip Art for the pictures of the mouse and lantern. You can download my file here. I did this so quickly that I didn't even cut up the pieces. So pretend they're nice and laminated and on a flannel board instead of just on a piece of paper sitting on my desk.